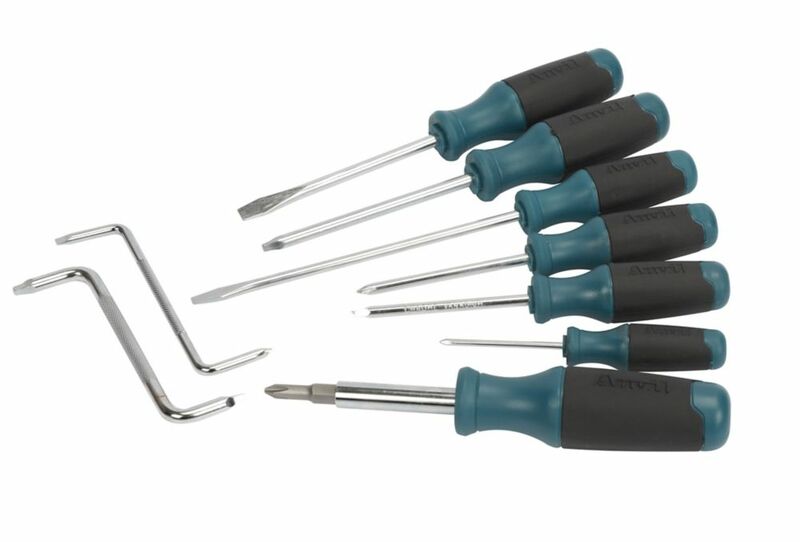 The ANVIL 9-Piece Screwdriver Set includes 2 slotted screwdrivers, 2 Phillips screwdrivers,2 square screwdrivers,2 offset screwdrivers and one 6-in-1 screwdriver. The ergonomic hexagonal handle shape provides additional torque and more comfort. These screwdrivers are the perfect assortment for any toolbox. 8Pc Screwdriver Set With Bonus 6 In1 Screwdriver The ANVIL 9-Piece Screwdriver Set includes 2 slotted screwdrivers, 2 Phillips screwdrivers,2 square screwdrivers,2 offset screwdrivers and one 6-in-1 screwdriver. The ergonomic hexagonal handle shape provides additional torque and more comfort. These screwdrivers are the perfect assortment for any toolbox. 8Pc Screwdriver Set With Bonus 6 In1 Screwdriver is rated 4.1 out of 5 by 18. Rated 4 out of 5 by JB from Enough quality. Enough quality. Rated 1 out of 5 by Disappointed from The only reason I can not recommend this product is because online it says it is a 9-piece set an... The only reason I can not recommend this product is because online it says it is a 9-piece set and when you go to purchase it in the store, it is only an 8-piece set. Both sets cost the same. So the advertisement is misleading.